Melissa's Mochas, Mysteries and Meows: Spring Naturals Cat Food Review & Giveaway! The day Tara was diagnosed as diabetic, the very first thing the vet advised me to do was pick up her dry food. It really wasn't an issue; while she always had a dish of dry food down for in-between meal snacks, she was never addicted to the kibble. For many cats, the transition away from a dry food diet isn't so easy. They get hooked on the "kibble crack" and cat parents find it nearly impossible to wean them off of it. So what are you supposed to do when the food your cat is determined to eat is contributing to an extremely serious chronic disease? It's not like you can make kitty understand that a drastic change in diet is necessary for their health. I was recently asked if Truffles would be interested in trying out a bag of Spring Naturals™ Dry Dinners, which uses only real meat, poultry or fish in their recipes, making for a leaner, low carbohydrate, highly digestible and extremely palatable food. They promise that every Spring Naturals product is made from premium quality, domestically sourced ingredients right here in the US. What intrigued me is that the super-premium brand was recently deemed low glycemic and diabetic friendly by the Glycemic Research Institute of Washington D.C., and it’s one of the few dry kibbles made in the USA to gain such certification. Cat foods with a high glycemic index lead to elevated blood glucose levels. This in turn can increase the risk of epilepsy, hypothyroidism, allergies, yeast infections, cancer and diabetes. Diets formulated with low glycemic ingredients are digested slower than high glycemic foods, allowing all of the nutrients to be properly absorbed. When food is digested slower and the nutrients are properly absorbed, pets will remain fuller longer which helps maintain weight control. While I still firmly believe that the #1 way to achieve remission and keep a diabetic cat "off the juice" is with a low carb, high protein wet food diet (Spring Naturals also has a line of canned food), I am so happy there are alternatives out there for cats that are hopelessly addicted to dry food. After all, the best diet in the world doesn't mean a thing if the cat won't eat it. For Truffles, a non-diabetic cat who enjoys eating dry food as a treat, I am happy to add Spring Naturals to our rotation of grain-free kibble. She's not so concerned that it's good for her, she just cares that it's yummy! If your cat is diabetic, please discuss any diet change with your vet because insulin doses may need to be modified. Spring Naturals is generously offering our readers a giveaway so you can give their food a try! 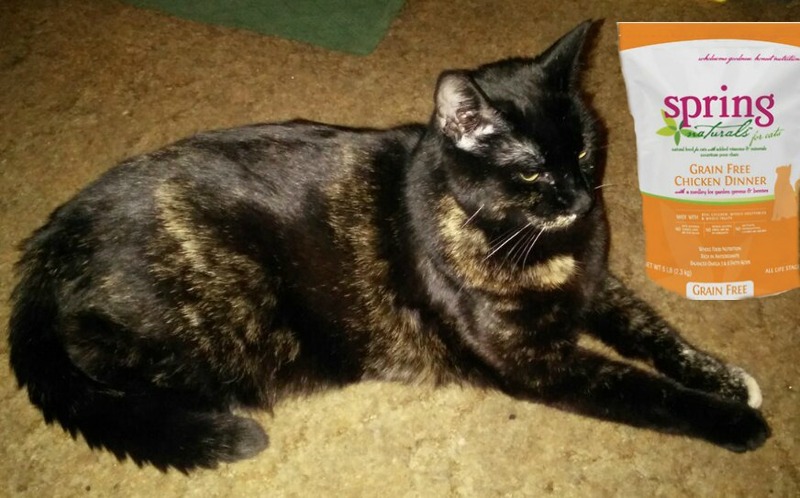 TWO lucky readers will win a 5 pound bag of dry food, their choice of flavor. Unfortunately, the giveaway is only available for those in the U.S., but non-U.S. residents are welcome to enter and donate their winnings to a U.S. shelter! Just use the Rafflecopter form below to enter. The giveaway runs through June 25, 2015. Good luck! To learn more about Spring Naturals’ fresh, new approach to pet nutrition, visit them at www.SpringNaturals.com or any of their social media sites, including Facebook, Twitter and Pinterest. FTC Disclosure: We received free food from Spring Naturals in exchange for our fair and honest review. Receiving free product did not influence our opinion about it; all opinions expressed on this site are our own. We only feature products we have used or would use or that we feel are of interest to our readers. Spring Naturals is not responsible for the content of this article. I would pick Grain Free Tuna & Chicken Dinner for my cat, Leonardo. What a great opportunity for someone to try this food! We're going to pass on entering this one since we are on canned only these days, but everykitty deserves high-quality food! We would go for the chicken dinner. Ths sounds like a good food. Thanks for hosting this great giveaway—I would choose the Grain Free Turkey & Salmon Dinner! This food sounds really cool. I wish I could feed Lita something like this. I think it would really benefit her. I would pick the turkey and salmon for my four babies. I would pick grain free chicken. WE are a chicken house here! Great post!!! That sounds like a good food.My kitties like chicken too. This sounds like some pretty good stuff. I'm with you on the wet food diet for optimal health. There are just too many problems associated with a dry diet. However, we don't live in a perfect world where we can just make cats eat what we want them to eat. Perhaps this food would be a great way to transition to healthier foods. My kitties would definitely prefer chicken. options are good yes. but I am not sure I believe chickpeas are really good for diabetic cats. and at 29% carbohydrates I'd be very careful with diabetics..
the canned food looks much better, but I'm curious about the natural flavorings added to all of them. Is the meat not enough of a flavor? Grain Free Tuna & Chicken Dinner sounds great. I would choose Grain Free Trukey and Salmon. I would choose the Grain Free tuna. Fish! Fish! I love tuna, I love salmon! Fish! Fish! Would they be interested in donating food to rescue groups? Either Tuna or Chicken & Salmon please. TW doesn’t like me eating kibble but I love it. grain free chicken dinner! OR the Salmon! I think my cats would like the Grain Free Tuna & Chicken Dinner best. I feed them grain free because one of them has a delicate tummy and if not on grain free throws up a lot. Tuna and Chicken or Salmon would be my cat's most likely choice! I would choose Grain Free Tuna & Chicken Dinner. My cats like fishy stuff so we choose Grain Free Tuna Dinner. My daughter would like the grain-free chicken dinner for her 2 cats. Our cat doesn't eat dry food anymore as his teeth are bad. This sounds so awesome. I know my big boy, Milo would love this. I would choose the Grain Free Turkey & Salmon Dinner! I think I'd pick the Grain Free Turkey & Salmon Dinner flavor if I'm lucky enough to win. I would choose the Grain Free Turkey & Salmon Dinner.